A keen observation of the transition from artsy hipsterhood to responsible adulthood, Michael Mohan’s Save the Date examines the difficulties young adults face considering grown-up phases like marriage when half of their parents have divorced. With irrepressibly appealing performers playing flawed characters, he strikes a chord that resonates, even if some of the notes are a bit familiar. 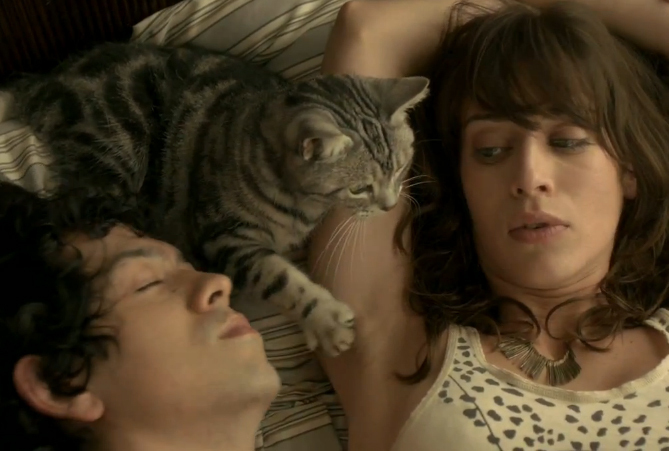 Lizzy Caplan (Bachelorette) stars as Sarah, a fiercely independent artist/bookstore manager who reluctantly agrees to move in with her adorable rocker boyfriend, Kevin (Geoffrey Arend). He’s so blissed-out about their new living arrangement that he’s completely tone-deaf to the fact that no, she wouldn’t appreciate being proposed to in front of all their friends (and a bunch of strangers, too) at the end of one of his packed shows. She’ll turn out all right though, since just before that happened, Jonathan (Mark Webber) was hitting on her, and he quickly becomes her adorable marine-biologist boyfriend. Sarah’s the kind of girl who knows she won’t end up alone, so she can afford to go through perfectly good, nice guys who will risk inevitable broken hearts to be with her, however temporarily. Yet in Caplan’s capable hands, an otherwise annoyingly entitled personality plays like a girl who just needs her space. Meanwhile, her sister Beth (Alison Brie) is planning her wedding to Kevin’s bandmate, Andrew (Martin Starr). They’re happy, but his feet are feeling a little chilly as he realizes the freedom he’s leaving behind, and she resents his disinterest in the details of the reception. Brie, who stars in TV’s Community and Mad Men, once again portrays a cute yet persnickety character to whom she brings depth and humanity. Key to the story and style of the film are Sarah’s ink drawings, created in real life by graphic novelist Jeffrey Brown, who co-wrote the screenplay. They serve as a creative window into Sarah’s soul while conveniently advancing the plot at a critical juncture. Their simple elegance is sometimes slightly undermined, however, by the clunkier aspects of the film, like Mohan’s proclivity for shooting his characters’ feet and the actors’ propensity to deliver all their lines as if they’re drunk or stoned, and an unplanned pregnancy. (Seriously, girls, use some birth control!) But these are nitpicks and largely overcome thanks to honest, heartfelt interactions between the characters, including a particularly moving exchange that takes place in front of a red-lit lingerie shop.